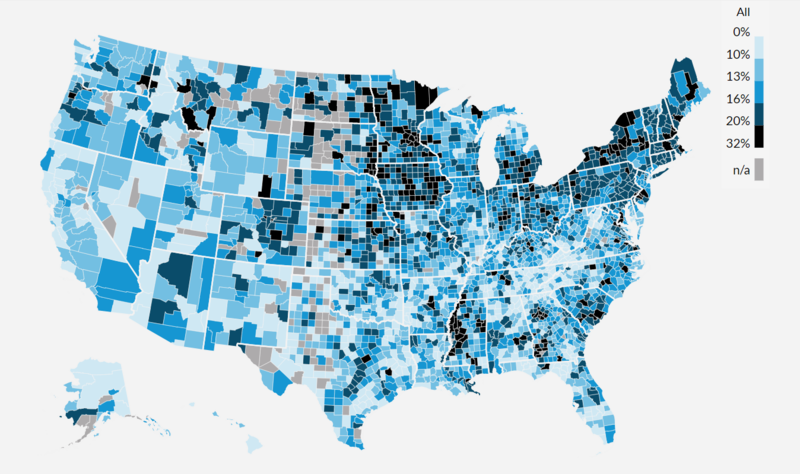 Map of the Week: Debt in the U.S. 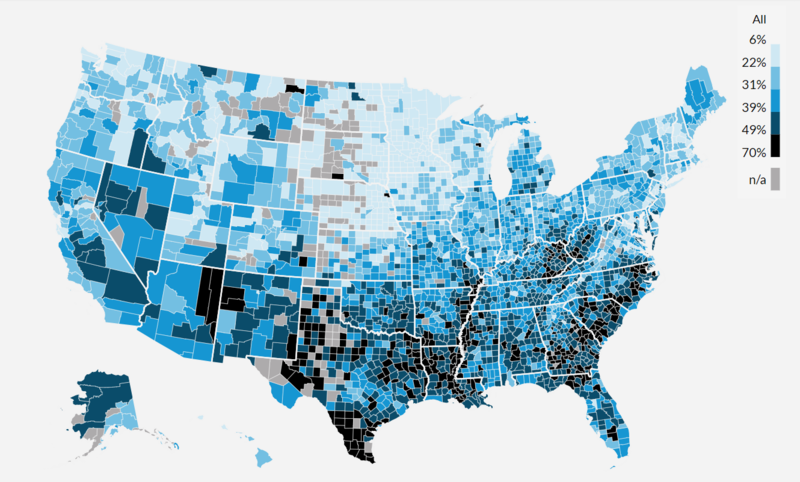 This gorgeous map from the Urban Institute illustrates something very important: Americans have a debt problem. In fact, most statistics show that the majority of Americans are in debt – whether that’s ‘good’ debt, such as a mortgage, or bad debt, such as outstanding student loan debt, credit card debt, or medical debt. This map focuses on the latter by breaking down medical and student loan debt across America, and shows some striking patterns about the geography of owing money. Nearly 1 in 5 households in the United States have medical debt in collections, referring to significant debt that has not been repaid on time and has been sold to a collection agency. However, medical debt varies broadly across the U.S.. The prevalence of overdue medical debt is ten times higher in Louisiana than in Minnesota. Southern states are hit hardest by overdue medical bills. According to the Urban Institute, eight of the ten states with the highest medical debt are in the South: Mississippi, Arkansas, West Virginia, South Carolina, Kentucky, Oklahoma, Alabama, and Georgia. Even when the study controlled for demographic variables such as age and education, the South was still deepest in debt. Across the nation, the percentage of Americans with medical debt has declined by 20 percent since 2012 when the Affordable Care Act was implemented, but less so in the South where many southern states did not expand medicaid when the act was passed. However, even when the study controlled for whether or not an individual had insurance, the south remained marginally more in debt. Experts hypothesize that financial education plays a major role in whether or not a person is able to benefit from having insurance. 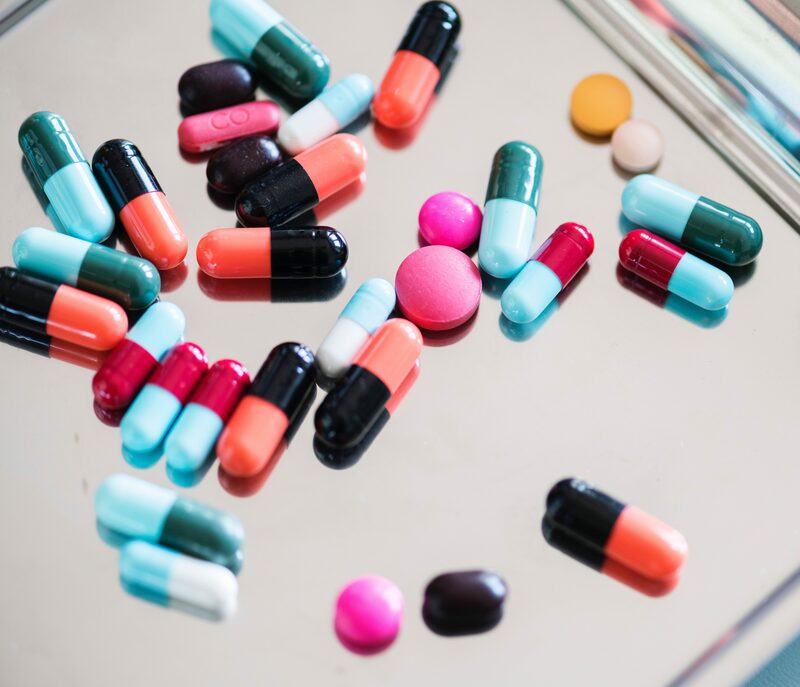 Even with insurance, many Americans get slammed with unexpected fees or balance billing because they don’t understand how their insurance works, which can put them into medical debt. Student loan debt, however, hits hardest in another region. Over the past decade, student loan debt has increased by more than 250 percent. The average student loan borrower owes $26,700, but in some places this number is much higher. In fact, the five states with the highest percentage of graduates in student loan debt are all located in the Northeast. 13 of the top 15 states for student debt are in either the Northeast or the Midwest, with South Carolina and Mississippi taking the remaining two spots. Student loan debt, like any debt, is difficult to shake off. Even among individuals who only borrowed for their undergraduate education, only half have paid off their federal student loans 20 years after beginning college in 1995-96. Among those same students, one-fourth defaulted on federal student loans within 20 years of beginning college, and more than half of those who defaulted within 20 years of beginning college were in repayment for three years before they did so. However, among students who began college in 2003-04, that same one-fourth defaulted within just 12 years after beginning college. Families in the northeast spend about 70% more on college than those in other US regions. The average family in the Northeast spends $35,431 on college, which is nearly twice that paid in the West. This is likely because 40% of Northeasterners enroll in 4-year private colleges – compared to 22% in the Midwest, 19% in the South, and 14% in the West. Private universities carry a much higher price tag than a public university, and of course, a higher price tag leads to more debt for families and graduates. This map from the Urban Institute not only illustrates the spread of medical and student debt across the United States, but also the debt disparity between white and non-white citizens. In almost every state and in both categories, a higher percentage of non-white residents have debt in collections, and the median debt is notably higher. This is likely because these families have to take out more loans to pay for medical and education expenses, and have more difficulty paying them back. This means that non-white residents in the U.S. are hit harder by medical and student loan debt. Maps like this are essential to helping us visualize problems in which geography may otherwise be overlooked.